This salad is what summer picnic dreams are made of. This salad is a punch of flavor in your mouth, or your face if you’re the kind of person that likes having salad thrown at their face. This salad is from Tracy over at Shutterbean and it makes me happy. To be clear, Tracy’s is made with farro. I couldn’t find it at three different stores because apparently I live in a farroless cavehole. If you can find it, which I’m sure you can somewhere, go full speed ahead with it. The best substitute I could find frantically through google on my phone was pearl barley, and there’s something about the name ‘pearl barley salad’ that just doesn’t do it for me. The next best name was confetti salad, followed by chop chop chop, followed by vegetables and barley. 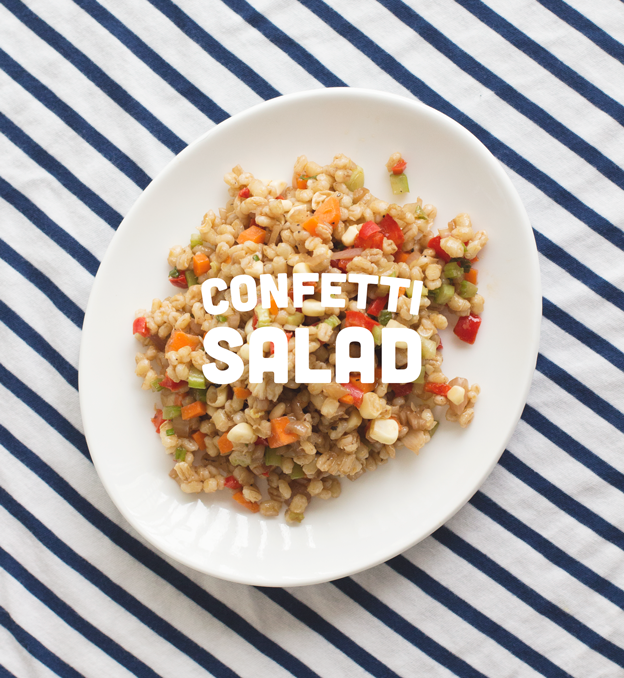 Confetti salad gets the square. The salad has a nice zip from the balsamic and a ton of crunch from all the vegetables. There’s a nuttiness from the grains, and it can easily be made into a whole meal with some shredded rotisserie chicken or some fried up chickpeas. All that goes into a tortilla with some sprouts and voom voom shebang, you’ve got a wrap. Seriously guys, let’s all have a picnic. Tracy suggests 1/3 c crumbled feta. I wouldn’t argue with that. I would also suggest that you can throw in whatever the hell you want vegetable wise. Whatever you do throw in, just use a little less of another vegetable so there’s enough dressing to go around. I think next time there might be some radish and raw zucchini for even more crunch appeal. *It’s important to grab pearled barley and not just barley. The pearled barley already has the outer hull removed so cooking time is far less. First off, cook your grains. Tracy has the time for the farro, I’ll give you the pearled barley. Bring 3 c of water to a boil, add your barley and kosher salt, reduce to a simmer, cover, and let it go for 30 min. Drain any remaining water and set aside to cool a little while you make the rest of the salad. This whole cooking time is perfect for chopping everything up. In a medium saucepan, heat 1 T of the olive oil and saute the onions until they’re soft, about 5 min. Turn off the heat and add the rest of the oil and balsamic. Combine everything in a large bowl and let sit 30 min before eating so the grains can absorb the flavor and serve it however you want. It’s meant to be served at room temp so it’s perfect for picnics and BBQ’s. Like I said above, a whole rotisserie chicken shredded up in here would be great or a can of chickpeas, drained, patted dry and quickly fried up would also be fantastic. YUM. I want this thrown at my wedding after the ceremony. So what. THROW IT! Also whenever I hear ‘so what’ I can only picture fred armisen’s snl impression of Joy Behar on the view. that salad’s a party! way to switch it up those grains, yo! send out evites cause this party’s about to happen! Yes.. this is picnic perfection…I say that with excitement as I throw confetti salad in the air. hell yeah it is! make sure you save some of it though so it can go in your mouth. Farroless cavehole! Way to still make it happen! Confetti salad and nautical-like tablecloths are where it’s at. P.S. I made that creamy sausage pasta dish on Sunday and I was up to my ears in dirty pots and dishes, but it was sooooo tasty. damn dishes! I definitely need to try and make it this weekend and plan to have someone else around to do the dishes for me. You, yo blog, and that salad are ab fab and though I’ve never met ya; can I start a rumor that you are my new best friend? ?